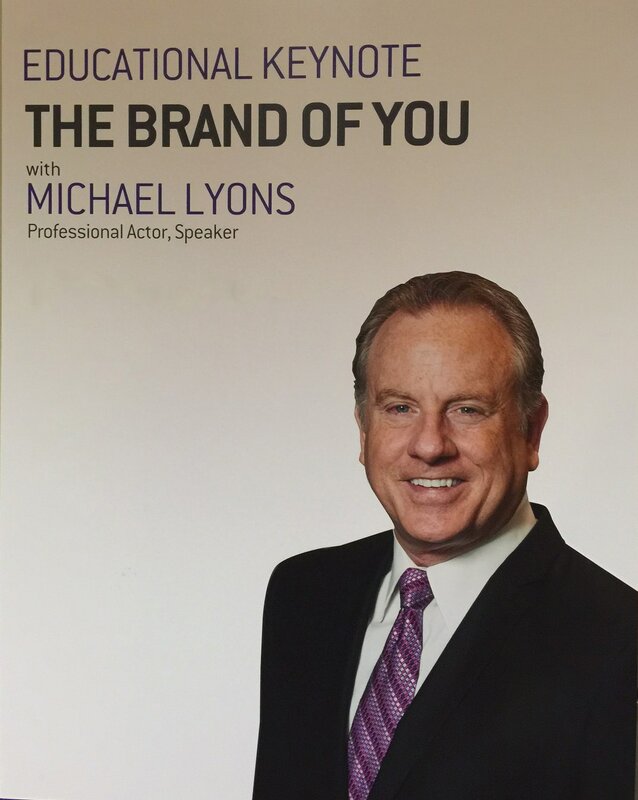 Highly-respected and acclaimed professional speaker Michael Lyons delivers talks across the US and abroad on a variety of subjects. He has served as a Keynote Speaker, Panel Member, Moderator, Session Leader and Emcee. As a thought leader and change agent, he focuses on the leadership traits necessary to succeed in today's competitive environment. His signature humor and easy-going style engage audiences to start thinking differently about their careers & lives, while inspiring them to go for it! With decades of experience in senior level corporate positions and entrepreneurial ventures, Michael shares his successes – and failures – to give audience members a fresh new perspective, and the motivation to take action. Michael customizes his talks (and will create new ones) based on the client's needs, and works closely with the event organizer to ensure the session's objectives are met. Click play on video to see five different clips of Michael speaking. Each of us is unique and, like it or not, represent a brand - the "Brand of You." How you present yourself, how you behave and how you are perceived by your professional peers determines your personal brand and the level of success in your career (and life). After all, if you don’t brand yourself, other people will. And, chances are they won’t brand you in the way you want to be branded. If you are not conscious of your personal brand and don’t work on it, you may fall short of your career aspirations. This session reviews the disciplines of business branding and applies them to the process of creating, developing, managing and protecting your own personal brand. Learn to identify your points of differentiation and how to capitalize on them. Learn how to delineate the dos and don’ts of self-promotion. Learn how to link your personal story to your professional experience to create your own value proposition. "I have been in the Sales and Marketing industry for over 25 years and I have attended well over 100 motivational speaker presentations. Michael's presentation on the 'Brand of You' is definitely in my top five! He was very engaging and the content was very relevant and informative. I highly recommend Michael as a speaker." Set Yourself Free: Daydream It... Believe It... Achieve It! The past few years have been a true test for everyone as we transitioned from the "Great Recession" to a semblance of normalcy. But in the wake of that difficult period, some people saw their jobs eliminated or downsized, while others were given more responsibility with the same (or decreased) compensation. With that experience as a backdrop, it's a good time to step back, re-evaluate our careers and life path, and consider a potential change in direction and attitude. In this entertaining, interactive and informative session, Michael guides the audience through a discussion asking them to reflect honestly on their life/career goals and assess where they stand as they contemplate their future. Drawing from content contained in his book of the same name, participants will walk away with tangible and manageable tips that will help them to stay focused on their life/career goals. Learn how to assess your progress towards meeting your life/career goals. Learn the tactics of how to stay on track on a daily basis. “As the President of the Greater Philadelphia Chapter of PCMA, I had the opportunity to invite Michael to be the speaker at our chapter meeting. The program 'Daydream It, Believe it, Achieve it', was a presentation that focused on issues in today's work-life balance struggle. It was a strong, very well organized program that dealt with a relevant topic that many of us struggle with. Due to his presentation style and ability, Michael was able to capture the audience’s attention and keep them fully engaged throughout the program. Because of this firsthand experience, I am happy to recommend him to any organization as a great speaker option." Everything and everyone is now on video, though most people don't like (or are uncomfortable) speaking on camera. In today's business world, odds are you will be interviewed or be asked to create a video for your web site or some other project. In this session, professional speaker and actor Michael Lyons will walk you through the steps that will ease the process and teach you the special techniques on how to get yourself camera-ready. Participants will learn useful tips they can use themselves, or to help prepare colleagues who must do on-camera interviews or videos. Learn how to relax and be more comfortable in front of a camera. Learn how to avoid the "uhms", "ahs" and "you knows" when speaking on camera. Learn how to come across as more confident, articulate and knowledgeable. Participants will also learn how to prepare their CEOs, session presenters, and others for on-camera appearances, press conferences, live sessions and Webinars. ​Ask about other Keynotes Michael delivers such as "Connections Matter: How to Maximize Networking Opportunities at Industry Events" and "Good Boss/Bad Boss" which delves into the traits and characteristics of both good and bad managers. Michael has worked with prestigious clients through the years. Here are but a few of the organizations who make up his client list. If you would like to have a free consultative call with Michael to discuss a potential speaking (or other) engagement, please fill out the Booking Form to get a free quotation now. Michael responds to all emails and calls within 24 hours. “I learned great lessons from his real life examples and advice. I immediately put into practice his wisdom and the principles he taught… they have made me a better leader and event planner. Thank you, Michael, for having such a powerful and unforgettable impact on me and my career." “Michael's diverse background and charismatic style contributes to his excellent public speaking opportunities. I have seen him as a Keynote Speaker, and he motivates and captivates his audience."